Regardless of how good a Mig/Mag Welding power source is, Spatter is a fact of life that many users accept, as being a downside to this process that they have to live with. Many people never even bother to analyse exactly how much this bi- product is actually costing them. 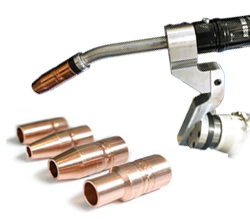 The adjustable MIG Transit Sprayer delivery system is a break through in welding technology; The systems are fitted to the shielding gas line after the wire feed unit and are an in-line system which, by atomising a unique fluid into the shielding gas flow, reduces the effect of spatter adhesion on the torch front end consumables, and immediate work-piece area. Ian Hamilton Engineering Ltd has the engineering capability to offer a full range of Air Cooled & Water Cooled Mig Welding Torches and Cleaning Stations and is the National Repair & Service Centre for Tregaskiss products working with ITW Welding Torches Europe. A complete Installation and Technical back up service is provided and an after service supply of Tregaskiss consumable parts, and Torch repairs are available. Ian Hamilton Engineering Ltd is the Sales & Service Centre for the Wire Wizard range of products for the UK and Ireland. The innovative new Wire Wizard Guide Module® system uses a series of rollers with bearings to allow the weld wire to “coast” around bends and corners in the conduit, eliminating the points of high friction that occur in these areas. 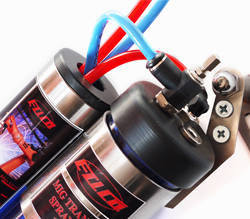 By eliminating this friction on the wire, it enables considerably longer conduit runs of 100 feet or more, allowing the wire package to be centrally located. Copyright © 2019, Ian Hamilton Engineering Ltd. Ian Hamilton Engineering for Tregaskiss, Spatter Shield and Wire Wizard.